When did contact between the Dorset and these early Europeans take place? The type of material found on Dorset sites suggests that the European contact relates primarily to the thirteenth and fourteenth centuries A.D., during the closing phases of the Norse colonies in Greenland. However, this evidence is at odds with many of the radiocarbon dates from these sites, which are significantly earlier and most frequently fall in the eighth or ninth centuries A.D.
Who were these early Europeans? It seems likely that the Europeans represented by these finds were Norse from the Greenland colonies. Helluland may have been an important source of walrus ivory, which was one of the Greenlanders' most valuable exports to Europe. 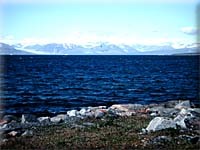 The much older radiocarbon dates associated with the Helluland sites which have produced European material, however, raise the possibility of an earlier European presence in Arctic Canada, pre-dating Eirik the Red's discovery of Greenland, and hinting at an entirely new picture of early European movement across the North Atlantic. What was the nature of the contact? The pieces of cordage and broken wooden artifacts found at Helluland Dorset sites are not the kind of material that we would expect to have reached the area through aboriginal trade from a distant source of European contact. Instead, they resemble the everyday objects and refuse which may have been left at shore camps located in the vicinity of Dorset settlements. 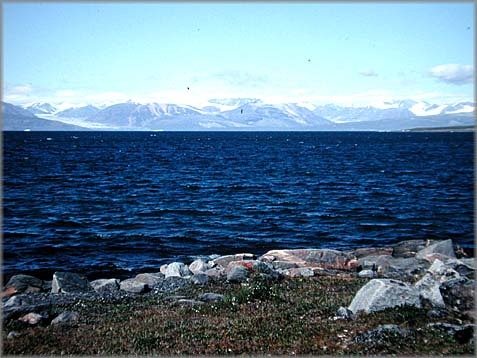 This type of material suggests a more extensive association between early Europeans and the people of Baffin Island and adjacent regions than had been previously suspected. Were Europeans living near or among the Dorset people of Helluland? Research which is planned as part of the Helluland Archaeology Project may soon answer this question. Two very different faces are carved on this antler wand. One is typical of Dorset depictions, showing a broad, rounded face with a small nose. The other is a long, narrow face with a prominent nose, heavy brows, and probably a beard, suggesting the portrayal of a European.